Don Worth has worked with a quiet perseverance for nearly sixty years creating images that rank him among the most profound photographers of the West Coast School. With his intense and studied focus, Worth has persistently sought an interior reality beyond the material boundaries of his subjects. While surrendering none of the natural organic character, his plants emanate a contemplative energy and finally evoke a spiritual iconography. Worth s large format landscape photographs are marked by an incisive clarity and quiet meditative aura and often reflect the subtle transformative powers of fog and mist. His unwavering and painstaking dedication has resulted in some of the most beautiful masterworks of twentieth century photography. CLOSE TO INFINITY presents for the first time a collection of Worth s finest work in a single elegantly bound monograph. Many photographs reproduced here have never been exhibited and were known only to the artist s closest friends. The addition of this unseen work unveils for the first time the full range of Worth s genius. A landmark volume, CLOSE TO INFINITY unfolds a stunning array of master prints, revealing a sustained and reverent photographic vision that is as breathtaking as it is profound. Leland Rice contributes an essay that examines Worth s artistic contribution, from his earliest years of apprenticeship and instruction, through the images that established his place in photographic history to the concluding masterworks that represent his mature achievement. 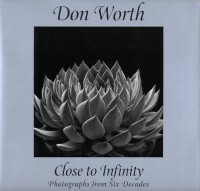 Don Worth was awarded a Guggenheim Fellowship in 1974 and an appointment from the National Endowment for the Arts in 1980. His photographs are included in countless major museums, including the Getty, MOMA and Chicago Art Institute.